How Do I Know If Frozen Shrimp Is Spoiled? Shrimp are highly perishable and require cautious handling when purchasing, storing and cooking to prevent foodborne illness. Store shrimp immediately in the freezer when you return from the supermarket unless you plan to cook them within 24 hours. When shrimp are properly packaged and immediately frozen, they can last up to one month in the back of the freezer. However, if you lose power or the temperature of your freezer drops for more than a few hours for any other reason, the shrimp may spoil, making them no longer safe to eat. Always check thawed shrimp for spoilage before consuming. Feel the shrimp when removing them from the freezer. They should be fully frozen, meaning that the temperature of the shrimp should be 40 degrees Fahrenheit or less. Thaw the frozen shrimp overnight in their original packaging. Place the package into a shallow glass baking dish or into a large zippered plastic bag in case the packaging leaks and set the dish into the fridge. Open the package and smell the thawed shrimp. Spoiled frozen shrimp have a strong ammonia smell while shrimp that are safe to eat have a slight saltwater smell. Check for a chlorine smell if you cannot smell ammonia. If your thawed shrimp smell like chlorine, it means they've been treated prior to freezing and have spoiled while in the freezer. Spread the thawed shrimp over a large baking sheet or cutting board and carefully examine each one. 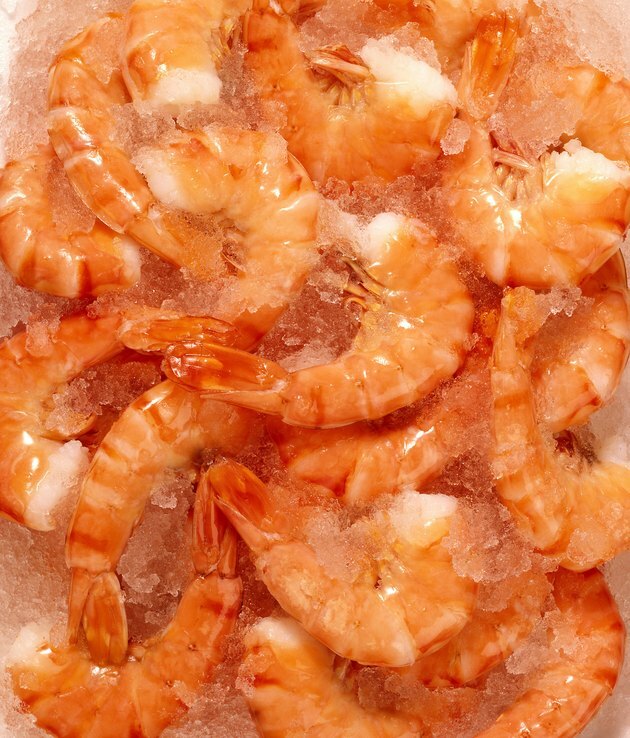 Multiple hardened and white areas on the shrimp are signs of freezer burn. Throw these shrimp away. Look for black spots on the shells of the shrimp. Multiple black spots indicate that the shrimp were old and beginning to break down before being frozen. It is very likely that they did not hold up well in the freezer and are now spoiled. If your frozen shrimp do not have a Best Before Date on their packaging when you purchase them, write one in a visible location so that you remember to use the shrimp before it spoils.